Man–it’s hard to believe I’ve been chronicling the amazing toy line that is Large James for almost eight years! As you know if you follow this blog regularly, I hold a special place in my heart for the weirder corners of the BJ mythos. Whether it’s the mid-70s P,A.C.K. (featuring package artwork by none other than Jack “King” Kirby) or the even stranger European offerings that never made it to the US of A, I really dig the crazy. I know the common collector wisdom is that the original sports/adventure theme is the purest expression of the line and the later departures from that only reflect a toymaker desperate to recover from flagging sales. The fact is, I just don’t cotton to conventional wisdom. I like to strike out on my own, to go against the flow, rage against the machine, let my freak flag fly and all that. It’s the reason why I backed the Complete Filmic Works of Antonio Fargas coffee table book on Kickstarter. The Doodlebug Simkins chapter alone was worth the price of the whole shebang, baby! Where was I? 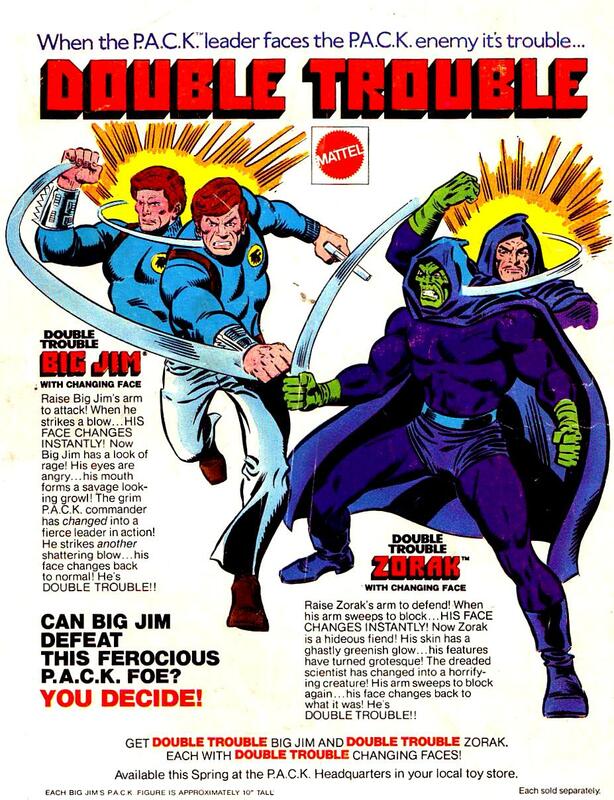 Oh yeah, the Big Jim comic ads. Today, we’ve got another of the legendary cross-sells that populated your favorite comic mags back in the mid-70s. This one doesn’t feature Kirby art, but to me it encapsulates the Marvel House Style of the time, in that it’s been attributed to Sal Buscema and Joe Sinnott. Now there are two gentlemen who to me loom large among other childhood-era giants like Herb Trimpe, Ross Andru, Al Milgrom, Ron Frenz and many others. Just check out vibrancy of this illustration. Would you not be tempted to check out these toys? I know I would–and did. Brilliant. REALLY happy this site brings out these corners of great weirdness that I would not otherwise find….big big thanks. Let the freak flag wave on. I’m not sure if it’s just me, but I don’t see any images on this page.